Ah, back to tights and boots for the time being. I still have a couple of sets of photos from California where I'm soaking up the sun sans tights and jackets, sand between my toes, and daisy dukes permanently on (you know me), but I'm holding off on posting those for now. It's not that any of those outfits are really that great, it's just that this dress deserved to be shared immediately. This is my third piece that the eShakti has sent me, and it's by far my favorite. As usual, there were a million things I wanted to choose, but the moment I laid eyes on this purple gingham number, I knew that it belonged in my life. As I'm sure you all know by now, eShakti has options to customize all of its clothing. I contemplated a couple of changes (such as adding sleeves or changing the neckline), but in the end, I decided that I actually the loved the dress as is and just opted to adjust the length. It ended up fitting like a glove, and I may never take it off. Gingham, lavender, AND fit & flare? It's basically my dream dress. It's been a while since I've worn this Brag Vintage blazer, so I figured this was the perfect opportunity to bust it out again. This was definitely one of those outfits that garnered a few "why is that girl so dressed up for class?" looks, but I don't care. Why would I wear sweats when I have such a pretty dress like this in my possession? The only thing I always get curious about whenever I'm on eShakti's website is the option to remove pockets. Has anyone ever decided that pockets on a dress or skirt weren't a good idea? Like the pockets were already on the item and they decided to click "remove pockets." Is that a thing that has ever happened? In non-clothing/how I spend all of my time when I'm not at work or school news, I FINALLY started watching "Veronica Mars." I know, I know, I'm extremely late, but there are so many shows that I love that I'll never be able to get around to every single one I want to watch. "Veronica Mars" has been on my list forever, but it took catching a marathon on TV to finally get me to sit down and watch it. Needless to say, I'm now hooked. Addicted doesn't even cover it. You look darling and spring ready! VM is super addicting, indeed. I am totally swooning over this dress! Ooh. 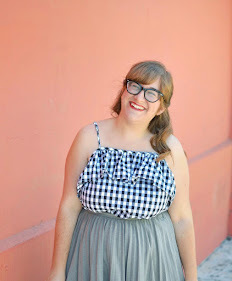 I haven't looked on eShakti in a while, and this gingham is so pretty on you!! This dress is absolutely adorable on you! This dress IS a dream. I love the colors! That dress is soooo great on you! Purple is definitely your color, lady! requesting NOT to have pockets sounds just bizarre. usually i would want to add some. anyway, you look gorgeous in this color Elana! i love it paired w/ the blazer & booties & if it helps, i'm kinda bummed i wont get to wear tights again all the way til fall now. oh, i got the package today- that sure was fast! thanks so much, the cuff is gorgeous & i didnt know the skirt had elastic on the back which is awesome. Just saw the Veronica Mars movie in theaters, so good. If you love the show then you have to see the movie after you finish the series! Good call on not changing it up- it's perfect! I love how the pattern of the fabric is mixed up, and as an AZ girl I always vote for sleeveless so that it's wearable year round. I've never ordered from them but when I borrowed Hannah's dress I thought it was super high-quality! You look darling and I say dress up for class!